Joel Embiid talks to reporters Friday at the Sixers' practice facility in Camden. Joel Embiid is listed as doubtful for the 76ers’ postseason opener against the Brooklyn Nets on Saturday, according to the NBA’s injury report released Friday afternoon after Sixers practice. Embiid said before the 76ers practiced Friday that he didn’t know if he would be able to play because of constant pain in his left knee. Embiid said he has been able to play with the pain, but that recently it has become worse. Whether he plays, he says, will be up to him. Embiid takes a shot at the practice facility Friday. 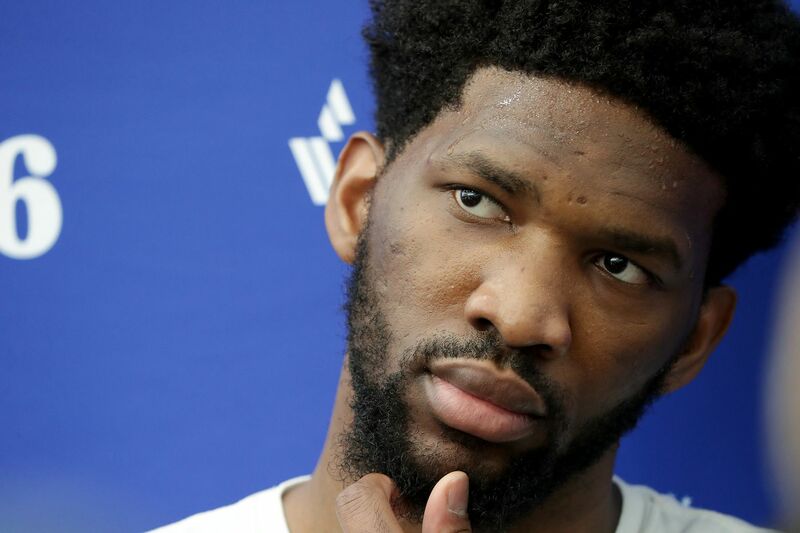 The Sixers, who tip off against the Nets in Game 1 at the Wells Fargo Center at 2:30 p.m. Saturday, released this statement: “Since the game at Chicago on April 6, Joel has continued his treatment program including conditioning, strength training and physical therapy." Embiid said the knee has been bothering him since he came back from the Feb. 17 All-Star Game, well before April 6. Embiid played 23 minutes and 11 seconds in the All-Star Game. He missed the next eight games after the break. He returned March 10 and played in 10 of the final 16 games. Even though the Sixers said in the statement that Embiid would be a partial participant in practice, coach Brett Brown said that Embiid wouldn’t practice. Media availability was before practice. Embiid says he wants to play but will be smart about it. If he doesn’t play, it will be the second time in two seasons that Embiid will miss the beginning of the playoffs. Last year he missed the first two playoff games in the opening series against the Miami Heat while recovering from a fractured orbital bone. If Embiid doesn’t play, it’s likely that 7-foot-3 Boban Marjanovic would start in his place. While Embiid’s status is doubtful, Jimmy Butler, who missed four of the final six games with a back injury, is ready to go. Forward-center Jonah Bolden, who has been experiencing left knee soreness, is listed as questionable for the playoff opener. Forward James Ennis is out with a right quad contusion that he suffered April 3. The Sixers originally said he would re-evaluated in two weeks, but an update on Friday says he will be re-evaluated on Monday. The only player listed on the Nets’ injury report is swingman Allen Crabbe, who is out with right knee arthroscopy. He last played on March 13.